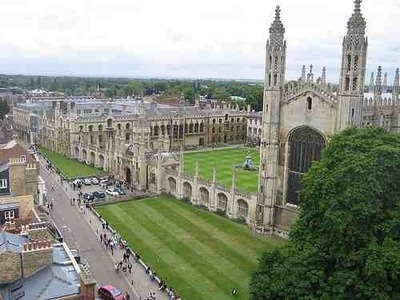 Cambridge is a beautiful old university town that still looks very much the part; with cobbled, bike lined streets that are frequently too narrow to take a car down, and a skyline dotted with many spires from the many college chapels and churches. It's also less than an hours train ride out of Kings Cross, and with train tickets starting from £17.10 – advanced booking – it's an inexpensive change of scenery for the day. Arriving at Cambridge station you'll notice the quiet right away. Of course there are cars, but there are a lot less of them. Just mind the bikes when you're walking around. The first thing you should do is pinpoint the location of King's College. This shouldn't be hard as they've got one of the most impressive churches of the lot, the King's College Chapel. 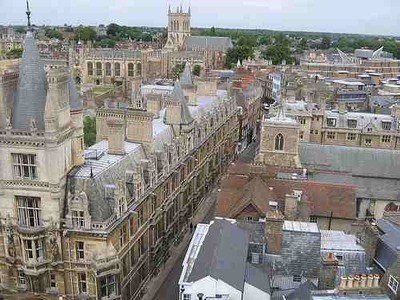 If you go by the skyline the main, pointy building is the chapel and the other main structure is the Cambridge University Library. While the chapel is a beauty to behold, especially if you're seeing it on a sunny spring day from 'the Backs', which is the bit of King's that runs along the river Cam, you'll probably also want to take a look inside. It's pretty fancy for an English building, lending heavily from the Italian style, and was built between 1444 and 1515. The roof and the windows are the high points, literally and figuratively. It's still used as the university's chapel and there are services held there almost every day, accompanied by the world famous King's College Chapel boys choir. 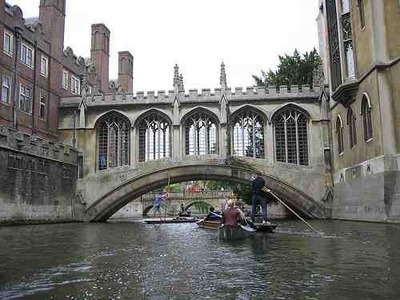 After seeing the chapel you're in a fine position for a stroll along the Cam, or a punt if you fancy it. It would be easy to while away a whole afternoon 'a punting' and a reading poetry, and this is what a lot of students probably do, but if you'd like to see a bit more of the city before retiring into one of Cambridge's many lovely old drinking establishments, then head back into town on one of those cobbled lanes. A few more sites worth marking on your, rather small, map of Cambridge, are Peterhouse - which is the oldest college in Cambridge, Pembroke College - which is one of the most prestigious colleges and also has some of the nicest gardens, Trinity College - where Prince Charles went to university, and one of the grandest of all Cambridge's colleges, and the Fitzwilliam Museum - which packs a lot of historic artistic and antiquarian punch for such a small city. After experiencing some, or all, of these highlights you should then make a point of retiring to one of those aforementioned drinking establishments. Even if you're not normally a drinker they're very much part of Cambridge's heritage, and are a good place to sit and mull over what it might be like to be a student in these beautiful, and hallowed, halls, streets and pubs. Hopefully it's been a rather educational day.